Across the icy plains of the Arctic and through the glacial wastelands of the Antarctic, Neville Shulman embarks on two exciting journeys to achieve his dream of reaching both the North and South Poles. Traveling through the Arctic as part of a small Tate Gallery team, Shulman first traces the footsteps of the international artist Andy Goldsworthy, eventually meeting him at the North Pole to witness his unique polar sculpture. Ten years later he sets out again, this time on an arduous expedition to the Antarctic and the South Pole, with the primary goal of raising money for the Red Cross. While on this journey he meets friend Robert Swan, the first explorer to walk both Poles. 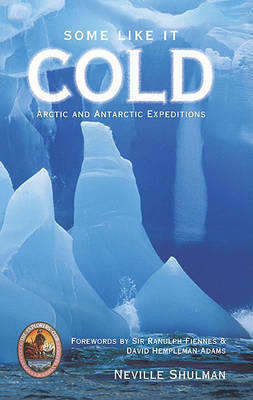 Throughout, as in all Shulman's adventures, Zen philosophy enhances his encounters with the polar wilderness and with nature and provides a unique perspective on what it means to travel in these remote, frozen territories. Some Like It Cold is full of humor and reflection and provides fascinating, in-depth information on the animal and human inhabitants of both regions as well as telling the stories of some of the greatest polar explorers past and present.